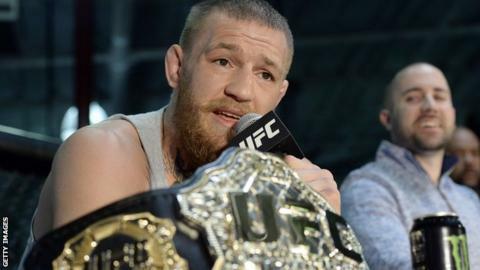 The Ultimate Fighting Championship (UFC), featuring such stars as Conor McGregor, Michael Bisping and Ronda Rousey, has been sold for a fee reported to be about $4bn (£3.1bn). Talent agency WME-IMG confirmed its purchase of the mixed martial arts promotional company on Monday. Founded in 1993, the UFC was bought for $2m (£1.55m) in 2001 by brothers Lorenzo and Frank Fertitta. It calls itself the fastest-growing sports organisation in the world. "No other sport compares to UFC," said Dana White, who will continue in his role as president of the UFC. "Our goal has always been to put on the biggest and the best fights for our fans and to make this the biggest sport in the world. I'm looking forward to working with WME-IMG to continue to take this sport to the next level." The UFC produces more than 40 live events each year and sells out some of the most prestigious arenas around the world. Shows are broadcast in more than 156 countries and territories, to more than 1.1 billion households worldwide in 29 different languages. The Fertittas will retain a passive minority interest in the organisation.